The blurb: Hannah, independent, headstrong, and determined not to follow in the footsteps of her bitterly divorced mother, has always avoided commitment. But one hot New York summer she meets Mark Reilly, a fellow Brit, and is swept up in a love affair that changes all her ideas about what marriage might mean. Hannah begins to dig into her husband’s life, uncovering revelations that throw into doubt everything she has ever believed about him. As her investigation leads her away from their fairytale romance into a place of violence and fear she must decide whether the secrets Mark has been keeping are designed to protect him or protect her . 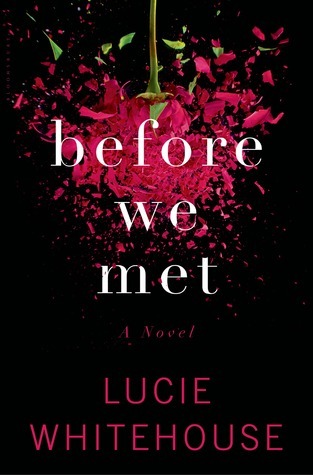 . .
My review: You can’t help but be grabbed by the cover of Lucie Whitehouse’s book Before We Met – the exploding rose is an apt and beautiful symbol for the deterioration of the main characters once perfect life. This novel is utterly gripping, I couldn’t put it down from the moment I picked it up. From the very first scene it played with the conventions of ordinary moments and twisted them on their head. There is something very chilling about imagining a missed pick-up at Heathrow. It’s a real possibility – what would you do if you were meant to be picking someone up and they just didn’t arrive?? So from that first moment, as a reader, you areinvested in Hannah’s situation. My only criticism is, whilst attempting to not ruin it for other readers, I am quite honestly sick with how these books always turn out. For once I want it to not be the obvious choice. I think when the first in the psychological thriller canon came out it was a surprise who the guilty party was but now it’s no longer shocking, in fact it’s not even a twist any more. But that said, it was still completely gripping, well-written and plotted and a book I couldn’t get out of my head.